To Cite: Moriguchi M, Aramaki T, Yoza K, Iwai K, Sato R, et al. Hepatic Arterial Infusion Chemotherapy with Cisplatin for TACE-Refractory or -Ineligible Hepatocellular Carcinoma with Child-Pugh Score of 8 or Above, Hepat Mon. 2017 ; 17(2):e43627. doi: 10.5812/hepatmon.43627. Background: This study aimed to retrospectively assess the safety and usefulness of hepatic arterial infusion chemotherapy (HAIC) with cisplatin in patients with hepatocellular carcinoma (HCC) and Child-Pugh (C-P) score ≥ 8, who were refractory to or ineligible for transcatheter arterial chemoembolization (TACE). Methods: In this study, 28 cisplatin-naïve patients with HCC, C-P score ≥ 8, and no evidence of extrahepatic lesions were treated using HAIC with cisplatin between July 2004 and July 2013. Results: Of 28 patients, 10 were refractory to TACE and 18 ineligible for TACE. In terms of C-P score, 17 patients had a score of 8, 6 a score of 9, and 5 a score of 10. The injected dose of cisplatin was reduced in 64.3% of cases. The overall response rate was 10.7%, with a disease control rate of 35.7%. Overall, median survival time (MST) and progression-free survival were 186 and 80 days, respectively. In patients with macroscopic vascular invasion (MVI-positive; n = 9), these values decreased to 161 and 72 days, respectively; while they increased to 341 and 87 days, respectively, in MVI-negative patients (n = 19). Patients achieving partial response (PR) and stable disease (SD) status as well as those achieving SD status showed significantly better survival than patients with progressive disease (PD status): PR + SD vs. PD: MST = 447 vs. 123 days, P < 0.001; SD vs. PD: MST = 447 vs. 123 days, P = 0.001). No serious adverse event or treatment-related death occurred. Conclusions: HAIC with cisplatin can be safely administered in patients with HCC and C-P score ≥ 8, who are TACE-refractory or -ineligible. An extended survival time is expected when the treatment outcome is either SD or more favorable. Transcatheter arterial chemoembolization (TACE) is a clinically beneficial treatment (1) that plays an important role in the treatment of hepatocellular carcinoma (HCC). Although surgical resection, radiofrequency ablation, and liver transplantation are considered to be curative treatments for HCC, for patients diagnosed with advanced stages of the disease at the time of first occurrence or recurrence, no curative procedure has been indicated. As such, although TACE could be considered for child-pugh (C-P) classes A and B (2, 3), for various reasons, these patients are often considered to be ineligible for TACE. In general, cases complicated with advanced vascular invasion or those with major arterioportal/arteriovenous shunt are also considered to be ineligible for TACE (2, 4). Moreover, there is clinical hesitation in performing TACE because of possible liver failure after embolization on the whole liver in patients with poor hepatic function, even if there is no advanced vascular invasion or major arterioportal/arteriovenous shunt. Sorafenib is the standard treatment used for patients with HCC who are refractory to or ineligible for TACE; but it is recommended only for C-P class A cases (5, 6). Although some reports regarding the use of sorafenib treatment for C-P class B cases have been published, the safety of sorafenib and its clinical utility have not been clearly established for these patients, with reports of poor outcome for cases with a C-P score ≥ 8 (7, 8). Therefore, no standard treatment for C-P class B TACE-refractory and TACE-ineligible HCC cases has been established, with these cases often posing a problem to treatment in clinical settings. For such cases, hepatic arterial infusion chemotherapy (HAIC) is often used in Japan. IA-call® (Nippon Kayaku, Tokyo, Japan) is a cisplatin fine powder approved for HAIC for the treatment of HCC. Results from a Phase II study of IA-call® for HCC have been reported, but were insufficient with respect to determining its safety and clinical usefulness, although C-P class B patients accounted for 37.5% of all patients included in the study (9). Moreover, in spite of several studies reported on HAIC with IA-call® (10, 11), examining only cases with C-P class B has not been performed. Therefore, the safety and efficacy of HAIC with cisplatin for the treatment of advanced HCC in patients with a C-P class B remains unclear. The aim of our study was to evaluate outcomes of HAIC with cisplatin used for treatment of patients with HCC and C-P score ≥ 8, who were refractory to or ineligible for TACE for various reasons, in order to determine the safety and usefulness of this treatment regimen. Between October 2002 and July 2013, cisplatin-naïve patients with HCC and no extrahepatic lesion, who were determined to be TACE-refractory or -ineligible and had a C-P score ≥ 8, were treated using HAIC with cisplatin. Diagnoses were based on the Japanese classification of primary liver cancer (12). The general exclusion criteria included cases with at least one of the following descriptions: performance status (PS) of 3 or 4, presence of extrahepatic lesions, history of cisplatin use, serum creatinine levels exceeding 1.5 mg/dL, allergy to contrast medium, and signs of active hepatic encephalopathy. Generally, determination of TACE refractoriness or ineligibility was based on the Japan society of hepatology consensus-based clinical practice guidelines for the management of hepatocellular carcinoma (13). Patients unsuitable for TACE because of insufficient hepatic function were also involved in our analysis. HAIC with cisplatin was administered using Seldinger’s technique, with 65 mg/m2 of the agent infused from the proper hepatic artery over 20 minutes, in principle. When lesions were limited to one lobe, the responsible blood vessel was used for the intra-arterial infusion in order to cover all lesions. The dose of cisplatin was reduced when the attending physician considered a potential risk for cytopenia, renal dysfunction, or other complications. For hydration, a 1000 mL infusion was administered prior to hepatic artery injection chemotherapy. A post-chemotherapy intravenous infusion of 1500 - 2000 mL/day was administered until the next day. 3 mg granisetron and 100 mg hydrocortisone sodium phosphate were also intravenously injected to prevent gastrointestinal symptoms such as nausea and vomiting. The treatment was repeated every 4 to 6 weeks. As endpoints to evaluate clinical usefulness, the direct anti-tumor effect was evaluated using the response evaluation criteria in solid tumors (RECIST) v.1.0 (14) every 4 - 6 weeks, and the safety was evaluated with the common terminology criteria for adverse events (CTCAE) v.4.0. Progression-free survival (PFS) and overall survival (OS) were evaluated using the Kaplan–Meier method. The log-rank test was used to compare survival times according to treatment outcomes. All statistical analyses were conducted with SPSS v. 19 (SPSS Inc., Chicago, IL, USA), and a P-value of < 0.05 was considered statistically significant. The study was conducted with prior approval from our institutional review board. All patients provided informed consent and the study was conducted in accordance with the Declaration of Helsinki. Table 1 shows the clinical background of the 28 patients included in our analysis. Our study group included 21 males and 7 females, with a median age of 73 years (range, 50 - 85 years). The number of patients with an Eastern cooperative oncology group performance status (ECOG PS) score of 0/1/2 was 8/18/2, respectively. Among our study group, 9 patients had a macroscopic vascular invasion (MVI), along with a unilobar localization of tumors in 5 cases, and a bilobar distribution in 23 cases. The distribution of C-P scores of 8/9/10 points was 17/6/5 cases, respectively. Among our patient group, 17 had a previous history of TACE. With regard to the current use of TACE, 10 patients were deemed to be TACE-refractory and 18 ineligible because of poor hepatic function and/or tumor spread. Abbreviations: AFP, Alpha-Fetoprotein; ALB, Albumin; Bil, Bilirubin; C-P, Child-Pugh; HBV, CRE, Creatinine; Hepatitis B Virus; HCV, Hepatitis C Virus; Hb, Hemoglobin; MVI, Macroscopic Vascular Invasion; NBNC, Non-HBV and Non-HCV; PIVKA-II, Protein Induced by Vitamin K Absence or Antagonist-II; PLT, Platelet; PS (ECOG),Performance; PT, Prothrombin; Status (European Cooperative Oncology Group); STATE, Selection for TrAnsarterial chemoembolization TrEatment; TACE, Transcatheter Arterial Chemoembolization; Vp, Portal Vein; Vv, Hepatic Vein; WBC, White Blood Cell. aValue are expressed as number presente or median (range), as appropriate. The dose intensities of cisplatin were as follows: 10 patients received the full dose, 12 received 70% - 80% of the full-dose, and 6 received 50% of the full-dose. Therefore, the cisplatin dosage was reduced in 64.3% of cases. Indications for a dose reduction included: cytopenia, increase in creatinine, poor hepatic function (C-P score of 10), tumor spread, and decrease in ECOG PS. Up to 50% of cases in which the cisplatin dose was reduced were in patients with a unilobar localization of tumors (Table 2). The median number of HAICs performed was 2 (range, 1 - 6). Abbreviations: CRE, Creatinine; PLT, Platelet; PS, Performance Status; WBC, White Blood Cell. aThe numerical data represent the number of cases. bThere is some overlapping of cases between categories. The direct anti-tumor effects of cisplatin, assessed by RECIST, are summarized in Table 3. A total of 0, 3, 7, 15, and 3 cases were categorized as complete response (CR), partial response (PR), stable disease (SD), progressive disease (PD), and not evaluated (NE), respectively. The overall response rate was 10.7%, and the disease control rate was 35.7%. The Supplementary File shows the case of a 72-year-old male patient with TACE-refractory HCC, bilobular HCC, and Child-Pugh score of 8, who showed PR with a reduction in tumor size after treatment. In macroscopic vascular invasion (MVI)-positive/-negative patients, the numbers of PR, SD, PD, and NE were 0/3, 1/6, 6/9, and 2/1, respectively. As to the relationship between dose intensity and treatment effect, a response was acquired only in cases in which the dosage of cisplatin was reduced, with no significant difference in disease control between patients who received the full cisplatin dose and those who received a reduced dose. Abbreviations: CR, Complete Response; DCR, Disease Control Rate; MVI, Macroscopic Vascular Invasion; NE, Not Evaluated; PD, progressive disease; PR, partial response; RR, Response Rate; SD, Stable Disease. Overall, the median survival time (MST) and PFS were 186 and 80 days, respectively (Figure 1A and 1B). The MST and PFS in MVI-positive patients were 161 and 72 days, respectively, compared to 341 and 87 days, respectively, in MVI-negative patients (Figure 1C and 1D). PR + SD cases and SD cases showed significantly superior survival time compared to PD cases (PR + SD vs. PD: MST = 447/123 days, P < 0.001; SD vs. PD: MST = 447/123 days, P = 0.001; Figure 1E and 1F). (A) OS of all cases, (B) PFS of all cases, (C) PFS and (D) OS for patients with/without macroscopic vascular invasion (MVI). (E, F) OS classified by treatment effect. (E) The partial response (PR) + stable disease (SD) group, showing significantly better survival than the progressive disease (PD) group. 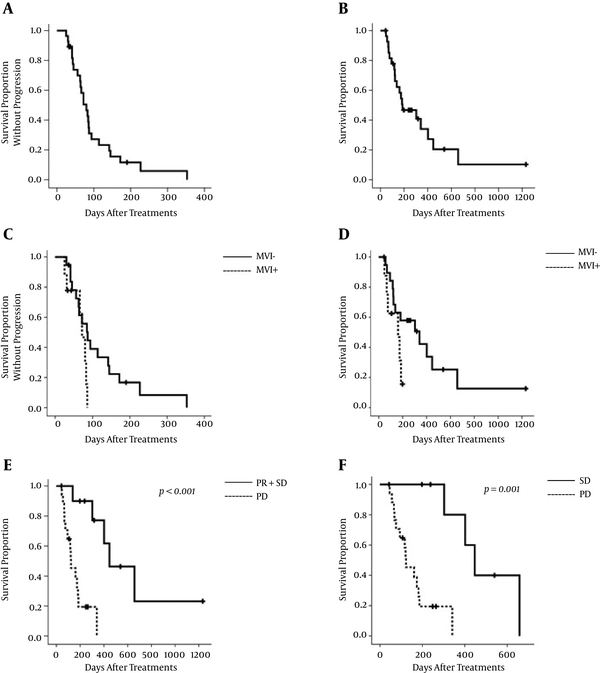 (F) SD vs. PD, showing significantly better survival of the SD group than the PD group. The incidence of adverse event ≥ grade 3 is reported in Table 4. Among identified adverse events, bone marrow suppression was more common. Also, alterations in liver function-related factors were identified in several cases. No patient required blood transfusion or administration of granulocyte colony-stimulating factor, and there was not any treatment-related death. BW increments ≥ 3 kg were observed in 9 cases (32.1%) and progression of abdominal distension or edema was observed in almost all cases. The relationship between dose reduction and the incidence of adverse events is summarized in Table 5. Although adverse events frequently occurred in patients receiving the full dose of cisplatin, BW was more likely to increase in these patients. However, there were no significant dose-related differences in the incidence of adverse events and changes in BW. Abbreviations: AE, Adverse Event; ALP, Alkaline Phosphatase; ALT, Alanine Aminotransferase; AST, Aspartate Aminotransferase; Bil, Bilirubin; PLT, Platelet; WBC, White Blood Cell. Abbreviations:; BW, BodyWeight; Gr, Grade. The Barcelona clinic liver cancer guidelines (2) and the Japan society of hepatology guidelines (3) use a liver function C-P class A or B as the criterion to determine the most suitable HCC treatment. Therapeutic options for HCC include surgical resection, radiofrequency ablation, TACE, and sorafenib administration. However, no established evidence-based treatment is currently available for patients with C-P class B liver function, for whom these treatments cannot be administered or are not expected to be effective. Therefore, the development of treatments for this specific patient group is essential. In Japan, HAIC is often used to treat HCC in these patients. However, the clinical usefulness of HAIC remains undetermined, with little data available for patients having poor liver function. In our study, we retrospectively analyzed treatment outcomes of HAIC with cisplatin in cisplatin-naïve patients with HCC and C-P score ≥ 8 who were considered TACE-refractory or -ineligible, with the aim of determining the safety and usefulness of this treatment regimen. Our review of relevant research identified scant information regarding the safety and efficacy of HAIC for the treatment of HCC in patients classified with poor liver function (C-P class B). The only study on this subject has been conducted by Miyaki et al. (15) evaluating the treatment outcome as a function of C-P score. In our study, the MST for the study group, overall, was 186 days (6.2 months), which was longer than the 3.9-month MST reported by Miyaki et al., although these two values cannot be directly compared due to differences in the characteristics of the patient group between these two studies. Moreover, the MST in MVI- negative cases and those without extrahepatic spread of the disease was 341 days (11.3 months), which was better than the 10.2 and 8.0 months of MST reported for the placebo groups in the Sorafenib hepatocellular carcinoma assessment randomized protocol (SHARP) trial and the Asia-Pacific study (5), respectively, which were conducted on C–P class A patients. Our finding supports the clinical usefulness of HAIC with cisplatin for patients with C-P score ≥ 8 who are considered TACE-refractory or -ineligible. On the other hand, the response and disease control rates reported by Miyaki et al. (15) were superior to our rates: response rate, 13.5% vs. 10.7%, respectively; disease control rate, 40.5% vs. 35.7%, respectively. In addition to the characteristics of the study group in Miyaki et al. and our study as a reason for the discrepancy, differences in outcomes can also be related to differences in treatment regimen. Miyaki et al. discussed the possibility that hepatic disorders in their study may have been adversely affected by their 5-fluorouracil treatment, with treatment-related failure in hepatic function identified in 27.7% of their patients. In our regimen, we used cisplatin fine powder as anti-cancer drug, with liver function-related adverse events of the regimen identified in 10% to 15% of the patients. However, these adverse events were usually transient and did not progressive to a severe state. Therefore, for TACE-refractory or -ineligible HCC patients with a C-P score ≥ 8, HAIC with cisplatin can be performed with little influence on hepatic function while improving overall prognosis. With regard to the relationship between dose reduction and treatment efficacy, we identified a comparable rate of disease control among patients who received the full dose of cisplatin and those who received a reduced dose. This is an important finding when we consider that the full dose of cisplatin was associated with a higher incidence of adverse events. Therefore, as our study provides evidence of a survival benefit and disease control of HAIC with cisplatin which was comparable for full and reduced doses, as confirmed using the RECIST criteria, a reasonable approach would be established to provide a reduced dose of cisplatin, as indicated for a patient. The positive effect of a full dose of cisplatin in increasing BW is likely to have been influenced by the increased hydration provided by the larger quantity of intravenous infusion used for patients receiving a full dose to prevent cisplatin-associated renal damage. Finally, among the 28 patients forming out study group, 9 MVI-negative cases were considered to be ineligible for TACE due to concerns about postoperative liver failure that could result in death or deterioration in quality of life. Recently, Bolondi and colleagues have proposed a sub-classification and revision of treatment strategies for intermediate stage (BCLC B) HCC because it represents an extremely heterogeneous population (16). According to their study, TACE is not recommended for patients with Child-Pugh score of 8 or 9 points because TACE would be likely to precipitate liver dysfunction. It seems that their concept supports the idea of our study that intermediate stage HCC with C-P score ≥ 8 was considered TACE-ineligible from the view point of hepatic toxicity. However, recently, TACE using drug-eluting microspheres has been developed, with emerging evidence of its relatively higher safety and effectiveness compared to conventional TACE with lipiodol in patients with bilobar, C-P B, and HCC (17). Therefore, TACE with microspheres for multiple HCCs may be beneficial, especially in cases with a C-P score of 8. However, it has also been reported that the prognosis of HCC patients with a selection for TrAnsarterial chemoembolization TrEatment (STATE) score < 18 is very poor (18). In our study, all 2 patients with a C-P score of 8 and 3 out of 6 patients with a C-P score of 9, who were MVI-negative and had no prior history of TACE, had STATE scores of < 18. Therefore, a better prognosis after TACE cannot necessarily be expected in many cases of this examination. Such cases would in fact commonly be treated with HAIC in practice due to concerns of hepatic failure leading to deterioration of quality of life or death after TACE. Some limitations to this study need to be acknowledged when interpreting our study results. These limitations include a small sample size, retrospective design, clinical population selected from a single center, ambiguous criteria for dose reduction and discontinuation, possible selection bias, and unknown validity of the clinical judgment relating to TACE non-response or ineligibility. To resolve these issues, a multi-center prospective study should be conducted in future. HAIC with cisplatin can be performed safely and appears to be clinically useful in patients with HCC and C-P score ≥ 8 who are considered TACE-refractory or -ineligible. The authors would like to thank the staff of Diagnostic Radiology and Interventional Radiology of Shizuoka Cancer Center. Authors’ Contribution: Study concept and design, Michihisa Moriguchi and Takeshi Aramaki; Acquisition of Data, Michihisa Moriguchi, Takeshi Aramaki, Rui Sato and Koiku Asakura; Analysis and interpretation of data, Michihisa Moriguchi, Kiichiro Yoza and Kenji Iwai; Drafting of the manuscript, Michihisa Moriguchi; Critical revision of the manuscript for important intellectual content, Masahiro Endo; Statistical analysis, Mihihisa Moriguchi, Mitsuhiro Furuta and Yuya Seko; Study supervision, Yoshito Itoh. Conflicts of Interest: The authors declare that they have no conflict of interest.